Qatar Stock Exchange (QSE) index gained 72.23 points (+0.74%) when the bourse closed trading at 9,862.03 points on Wednesday. The daily turnover increased to QR 2.280 Billion with a volume of 7,044,666 shares from 2,995 deals compared with QR 2.199 Billion with a volume of 5,481,666 shares from 3,846 deals on Tuesday. Indices of all sectors ended in the green today, while Real Estate index sector in the green, up +1.18% to 2,230.05 points. Industries sector index increased +0.89% to 2,940.55 points. QSE Total Return Index gained +0.74% when it closed at 15,329.11 points today. QSE Al Rayan Islamic Index closed +1.14% to 3,631.77 points. QSE All Share Index up +0.76% to 2,635.50 points. 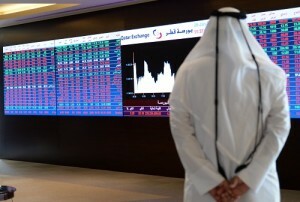 From the 43 companies listed on QSE, 41 saw trading today. From these, 26 gained, seven closed lower and eight remained unchanged.